Removing the roof from the Audi R8 has made one of the most exciting high performance cars even more charismatic. R8 Spyder is extremely fast, extremely capable and, thanks to the folding fabric roof, it’s even easier to appreciate the glorious, howling, crackling V10 engine. In short, it's absolutely sublime. Folding the top takes 20 seconds at speeds up to just over 30mph, so it’s possible to raise or lower it on the move around town. The choice of fabric, as opposed to a metal multi-piece metal roof, means weight is kept down, while engineers have worked hard to maintain body rigidity with various components using thicker metal than in the coupe version. Drive is sent to all four wheels via a seven-speed automatic transmission, which can be overridden by the driver using paddles on the steering wheel. That means there’s plenty of control over the engine when needed, such as when tackling a series of bends. But if you're stuck in a stop-start traffic jam or cruising for a few hundred miles on the motorway, the R8 is really easy to drive. There are several different driving modes, which change everything from the throttle response to the amount of noise the exhaust makes. If there is one thing about the R8 Spyder that stands out, it’s the noise. It sounds fantastic, with a soaring howl as the revs climb and - in any one of the sportier settings - thumping, thunderous cracks on the overrun, which sound all the better with the roof down. Performance is, as you would expect, rapid. The 540PS V10 propels the R8 from 0-62mph in just 3.6 seconds, while on the move an overtake is as simple as applying a bit more throttle. The steering is well-weighted, quick and accurate, plus there is a huge level of traction thanks to the quattro all-wheel drive system, which is very reassuring with so much power on tap. Economy - not that it's important in a car like this - is 24.1mpg with emissions of 277g/km. A sports car veteran might detect a bit of flex in the chassis - something that can upset the handling of soft-top cars - but to most drivers the R8 Spyder is more than stiff enough, neatly tackling bends without any obvious body roll. Despite that fact, it’s surprisingly comfortable for a performance car. Sure, it’s firm over speed bumps and potholes, but it’s never harsh, whether equipped with the optional £1600 magnetic ride system or standard suspension. It’s plush inside too. This is no stripped-out, back-to-basics machine – there’s leather upholstery, solid build quality and typical Audi attention to detail, from little things like the perfectly damped close on storage bin lids to buttons and dials that feel just right when operated. It feels futuristic and high-tech, too – thanks to the Audi Virtual Cockpit. The display for everything from speed and temperature to navigation, music and mobile phone connectivity is in the instrument binnacle behind the steering wheel. It’s crystal clear and all controlled from a rotary dial on the centre console, or via steering wheel buttons. It works beautifully, enabling the driver to keep eyes ahead all of the time and to emphasise the info they want to see most of all. That said, the passenger can’t really do much since everything is out of sight in front of the driver. If they want to pair up a phone via Android Auto or Apple CarPlay it’s a bit of a fiddle compared to a traditional touchscreen, mounted in the centre of the car. They can still reach controls for skipping tracks or changing the volume, on the plus side, along with ventilation and a few other controls. In terms of practicality, the R8 Spyder isn’t great. The mid-mounted engine means there is no rear boot, but there is a storage area under the bonnet which is large enough for a couple of soft bags or a small trip to the shops. Inside there are some little cubby holes, but space is very limited. That said, weekends away won’t be out of the question as long as you pack light. There is a surprisingly lack of features when it comes to equipment – cruise control and a reversing camera, for example, are optional extras, while safety gadgets including adaptive cruise control and autonomous emergency braking aren’t offered at all. There are still plenty of extras though, including various colour combinations and leather finishes, meaning buyers can create an R8 to suit their style. 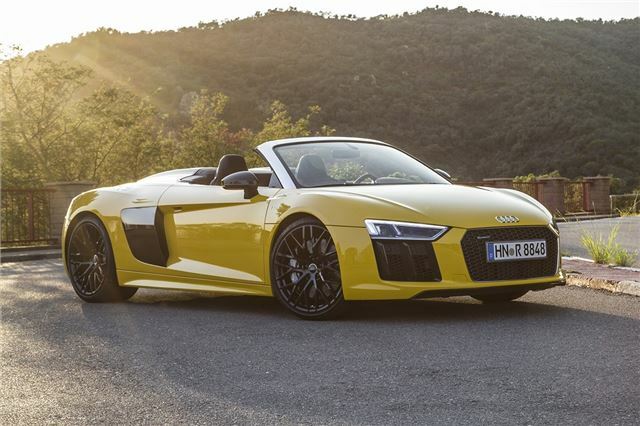 Slight niggles aside, it is very hard to find fault with the Audi R8 Spyder. It’s more dramatic than the coupe from the driver's seat, thanks to the rush of wind and screaming engine, plus it has real supercar presence. Sure, at around £130,000 it’s expensive, but it has more character than the similarly-priced Porsche 911 Turbo Cabriolet. If you’re after a drop-top performance car, the R8 Spyder should be very near the top of your list.